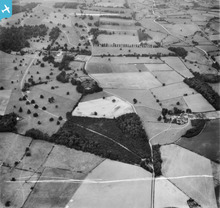 [EAW010837] Lionlodge Covert and surrounding countryside, Little Ingestre, 1947. This image was marked by Aerofilms Ltd for photo editing. This photograph shows the importance of the approach to Ingestre Hall from Lion Lodges. 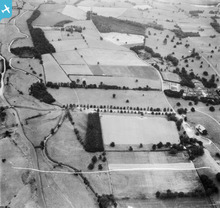 [EAW010835] Trent Walk, Alder Coppice and surrounding countryside, Ingestre, 1947. This image was marked by Aerofilms Ltd for photo editing. This shows the Trent Walk avenue of trees leading up to Ingestre Hall and the Orangery.